You can’t see it, but, if you live in Bronx County, New York, asbestos might be killing you, your family or your workers. We can help. We have more than 25 years experience with asbestos abatement (removal) and asbestos remediation (site clean up) in the Bronx and throughout Greater New York and suburbs. Asbestos causes deadly diseases like cancer, Asbestosis and Mesothelioma, but most people don’t even know they are being exposed. Asbestos was used in the manufacture of asbestos insulation, asbestos flooring and roof tiles, asbestos shingles, sheetrock, plaster and, most commonly, in vermiculite “popcorn” ceilings until the late 1970’s. If your home or commercial building in Bronx County, New York was erected before 1978, it is almost a guarantee you have asbestos in your building and, until the asbestos is removed, people’s health will suffer. But how is this invisible killer detected? Through air sampling. The first thing we do is send an independent testing firm to the building to determine if asbestos is present. It asbestos is found, we dispatch our licensed, insured and certified team to set up a sealed safe zone around the contaminated area and wet down the material to prevent its airborne spread. 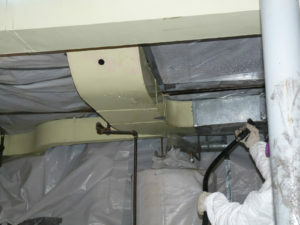 Negative air machines maintain pressure to ensure no other deadly asbestos fiber floats into to the air. In abatement, we carefully scrape and removed any asbestos and dispose of it carefully off-site. Next we do removal, sealing the exposed area and immaculately cleaning the whole zone with special filtered equipment. Then the air is again tested and, only when no asbestos is found, are your family or workers allowed back in the building. For asbestos removal and abatement services in Bronx County, NY. Call (877) 645-1428.